This picture has nothing to do with today, but I really like this picture. 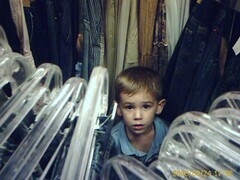 Soren is hiding in a clothes rack at a womens clothting store. That really takes me back. It is great to have kids. Today was such a great day that I have to praise God for it publicly. I took off today just to run some errands and take care of some business at home. Surpisingly, I finished it all, and I had a great time doing it. Soren and I ran errands this morning. It was a pleasure to spend one-on-one time with him. We ate lunch with my mom. I played a little with the boys. I fertilized the yard. Perhaps the biggest accomplishment was actually getting my car registed. It was only 5 months past due! God is good, and I am thankful.